Luke Short was born in Mississippi in 1854. When he was a child his family moved to Grayson County, Texas. He developed a reputation as a violent young man and he admitted to killing several Native Americans in his teens. In 1870 Short arrived in Abilene where he attempted to become a professional gambler. He also became involved in selling alcohol to the Sioux in Nebraska. He also worked as an army scout (1878-79). The following year he moved to Tombstone and in 1881 killed Charlie Storms during a fight in the Oriental Saloon. Short now moved to Dodge City and in February, 1883, he purchased the Long Branch Saloon with W. H. Harris. A power struggle now took place between Short and Nicholas B. Klaine, the editor of the Dodge City Times. In the election for mayor of the city later that year Klaine supported Larry Deger against Short's partner, W. H. Harris. Deger defeated Harris 214 to 143. Soon after gaining power Deger published Ordinance No 70, an attempt to ban prostitution in Dodge City. Two days later the local police arrested female singers being employed in Short's Long Branch Saloon and accused of being prostitutes. That night Short and L.C. Hartman, the city clerk, exchanged gunfire in the street. Short was now arrested and forced to leave town. Short had some powerful friends and in June 1883 he returned to Dodge City with Wyatt Earp, Bat Masterson, Charlie Bassett, Doc Holliday and other well-known gunfighters such as, M. F. McLain, Neil Brown and W. F. Petillion. However, Deger and Klaine refused to be intimidated and when they refused to back down, Short and his friends had to accept defeat. In November 1883, Short and Harris sold the Long Branch Saloon and moved to Fort Worth. On 8th February, 1887, Short killed Jim Courtright in a gunfight. Luke Short died of dropsy at Geuda Springs, Kansas, on 8th September, 1893. The situation here in town is unchanged except so far as relates to public opinion, which is gradually but steadily changing in your favor. All your friends are at work with a determination which is bound to win in the end. Of course every movement must be made with the greatest care and caution, and as many are too timid to express themselves, it will naturally require time, before the organization that style themselves "the Vigilanters" will be convinced that they must give way to public opinion. And a beautiful lot of reformers they are, these vigilanters, under the leadership of their captain, Tom Nixon of Dance Hall fame. But no matter how slow, you may rest assured that this time will surely come. As the heat of passion subsides and men begin to look over the past more calmly, they can not help to see that a great wrong has been committed and many are frank enough to admit that fact. Men of good standing in this community, against whom nothing can be said, but who take little interest in the management of public affairs, feel that they are not safe in the enjoyment of their life and property in a place where such outrages may be committed without the interference of the authorities, and feel more alarmed when they begin to realize the fact that the outrages here were committed not only without interference, but under the guidance of the municipal government, whose duty it should be to protect even those charged with the commission of a crime against violence. Just before the last city election the mayor was a man named Webster, the proprietor of a dive, half saloon and the other half gambling house and variety hall. He was a representative of the tougher element of the sporting fraternity. The head of the other faction was W. H. Harris, of Harris & Short, proprietors of the Long Branch saloon. Harris represented the quieter and more reputable element and there was bitter feeling between the two. At the last election Harris was beaten in the race for mayor by one Deger, Webster's candidate, and since then it has been conceded that it was only a matter of time when all of Harris's sympathizers would be driven out of the town. Thus Dodge has been hovering on the brink of trouble for a long time. About ten days ago it came. Mr. Short, who is Harris's partner, and a police officer, had a shooting affray. Neither were hurt, and the evidence showed that Short was Bred on first. He was nevertheless placed under bonds, and next day thrown into jail. The marshal of Dodge, who made the arrest, is Jack Bridges, a well known character, who formerly lived here and traveled principally upon having "killed his man." A short time later five gamblers were arrested, and also jailed. That night a vigilance committee was formed with Tom Nixon, the proprietor of one of the hardest dance halls that ever existed in the west, at the head. This crowd repaired to the jail and notified the prisoners that they must leave town next morning and that they would be given their choice of trains going east or west. Meantime the vigilantes took possession of the town. The correspondent of the Chicago Times and other leading papers were notified that they must not be permitted to send any telegrams in reference to the situation and a body of armed men watched the arrival of each train to see that there was no interference. A lawyer from Lamed, sent for by one of the prisoners was met by a vigilante who leveled a shotgun at his head and told him not to stop. He passed on. Next morning the five gamblers were put on a westward bound train and Short left for Kansas City where he is at present. The trouble has by no means yet abated. The place is practically in the hands of the "vigilantes" and the situation is more serious from the fact that the mayor is acting with them and it was he who notified the prisoners that they must go. The trains are still watched and armed men guard the town, while a list of others who will be ordered out has been prepared. Every source of reliable information indicates that Dodge is now in the hands of desperadoes, and that incident to the ejection of Short and the others, the lives and property of citizens are by no means safe. For this reason martial law is being asked. That there will be trouble of a very serious character there, is anticipated. Your telegram to me of the 11th is at hand. I am glad to be assured by you that you are able to preserve the peace of Dodge City, and of your county. The accounts of the way things have been going on there are simply monstrous, and it requires that the disgrace that is being brought upon Dodge City, and the State of Kansas, by the conduct that is represented to have occurred there, should be wiped out. Your dispatch to me presents an extraordinary state of affairs, one that is outrageous upon its face. You tell me that the mayor has compelled several parties to leave the town for refusing to comply with the ordinances. Such a statement as that if true, simply shows that the mayor is unfit for his place, that he does not do his duty, and instead of occupying the position of peace maker, the man whose duty it is to see that the ordinances are enforced by legal process in the courts, starts out to head a mob to drive people away from their homes and their business. It was the mayor's duty, if he did anything, to have appointed and sworn in special policemen to protect citizens, and if he could not do it, to have called upon you, or have called upon me, for assistance to aid him in executing his duties as mayor, and in preserving the peace of his town. It is represented to me by affidavits, and by statements, that the best men in Dodge City have been threatened with assassination, and with being driven away from their homes, if they raised their voices against the conduct of this mob. Now if this is true, it is your duty to call to your assistance a respectable number of people, sufficient to enforce the law, and protect every man in Dodge City, without any reference to who he is, or what his business is, and if he is charged with crime, or the violation of law, to see that he has a fair trial before a proper tribunal, and that the sentence of the law is executed by you or by the authorities, according to the command of the court. It is represented to me also that at this very time, and ever since this pretence of the mayor that he was trying to enforce two ordinances against women visiting saloons, that he has prohibited it only as to one saloon, made arrests in one case, and permitted that ordinance to be violated every day and every night, to his own personal knowledge, and that of the marshal and police officers of the city, by other men who were running saloons where women are permitted to visit, and sing and dance. Now Mr. Sheriff, I desire to remind you that your duty as a public conservator of the peace, and also having authority over and above the mayor of Dodge City, if he fails to discharge his duties, that it is your duty to see that these things are not permitted and are not tolerated, and that no citizens shall be interfered with, that no citizen shall be driven away from his home, that the mayor of Dodge City shall not pick out men and say that the ordinances shall be enforced against them, and shall not be enforced against others. Luke Short is a Texan, who came to Dodge some two years ago, and having been interested in the cattle business himself - as, indeed, he is still - he had an extensive acquaintance with other cattlemen and their employees. At Dodge he engaged in the saloon business with a man named Harris, and his friendly relations with the numerous Texans coming to Dodge has made Harris & Short's saloon the most popular and profitable one in the city. Mr. Webster, late mayor of Dodge City, is also a saloon keeper, and during his term of office removed from a more remote location to one next door to Harris & Short's "Long Branch," on Front street. While Short's popularity has increased, that gentleman modestly stated, Webster's has declined, and finding it impracticable to secure his re-election to the mayoralty, Webster some weeks before election brought out Mr. Deger as a candidate, against whom Harris, Short's partner, was nominated. Deger had been a foreman for Lee & Reynolds, who are engaged in freighting, and had their place of business outside the city limits. About March 1st, however, it is said, Deger began boarding at the hotel in town, in order to gain a legal residence. The night before election the construction trains of the Santa Fe railroad, manned by men residing at different places scattered along the line, were run into Dodge, and the next morning the men were all on hand, obtained control of the election board by filling vacancies under the forms of law, and voted. Thus Deger was elected by a majority of seventy-one in a poll of between 300 and 400 votes. Deger, Messrs. Short and Petition declare, is a mere creature of Webster. The saloons of Dodge City, these gentlemen say, are all of similar character including bars for drinking, gambling tables, and games of various kinds, arrangements for variety performances, or at least singing, and all employ women who are admittedly of loose character, and are provided with facilities for plying their business. In addition to the saloons there is a dance house, carried on by a man named Nixon, who was formerly an adherent of Harris, but shortly before election transferred his allegiance to the Deger-Webster party. His place is said to be of the lowest and vilest character. The troubles at Dodge City are assuming serious proportions, and the governor must interfere very soon or a terrible tragedy will undoubtedly result. The men driven out may be men who are classed with the sporting fraternity, but as far as known they are no worse than the men who have been chiefly instrumental in driving them out. But setting all question of comparative respectability aside, the whole affair resolves itself into a matter of victory for superior force, and not law. Luke Short, the chief of the band of men lately exiled, has his interests in the town, and claims he has been wronged. The vigilantes who drove him and his friends away assert that they are evil characters. Law has been set aside and force is the sole resort. Governor Click has been attempting to preserve the peace, but so far has made no great progress. The sheriff acknowledges that he cannot protect the exiled men should they return, and so the matter stands at present. Yesterday a new man arrived on the scene who is destined to play a part in a great tragedy. 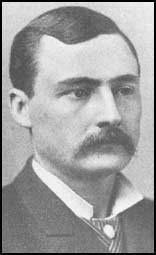 This man is Bat Masterson, ex-sheriff of Ford county, and one of the most dangerous men the West has ever produced. A few years ago he incurred the enmity of the same men who drove Short away, and he was exiled upon pain of death if he returned. His presence in Kansas City means just one thing, and that is he is going to visit Dodge City. Masterson precedes by twenty-four hours a few other pleasant gentlemen who are on their way to the tea party at Dodge. One of them is Wyatt Earp, the famous marshal of Dodge, another is Joe Lowe, otherwise known as "Rowdy Joe;" and still another is "Shotgun" Collins; but worse than all is another ex-citizen and officer of Dodge, the famous Doc Halliday. A brief history of the careers of these gentlemen who will meet here tomorrow will explain the gravity of the situation. At the head is Bat Masterson. He is a young man who is credited with having killed one man for every year of his life. This may be exaggerated, but he is certainly entitled to a record of a dozen or more. He is a cool, brave man, pleasant in his manners, but terrible in a fight, and particularly dangerous to the ruling clique, which he hates bitterly, Doc. Halliday is another famous "killer." Among the desperate men of the West, he is looked upon with the respect born of awe, for he has killed in single combat no less than eight desperadoes. He was the chief character in the Earp war at Tombstone, where the celebrated brothers, aided by Halliday, broke up the terrible rustlers. Wyatt Earp is equally famous in the cheerful business of depopulating the country. He has killed within our personal knowledge six men, and he is popularly accredited with relegating to the dust no less than ten of his fellow men. "Shot-Gun" Collins was a Wells, Fargo & Co. messenger, and obtained his name from the peculiar weapon he used, a sawed off shot gun. He has killed two men in Montana and two in Arizona, but beyond this his exploits are not known. Luke Short, the man for whom these men have rallied, is a noted man himself. He has killed several men and is utterly devoid of fear. There are others who will make up the party, but as yet they have not yet arrived. This gathering means something, and it means exactly that these men are going to Dodge City. They have all good reason to go back. Masterson says he wants to see his old friends. Short wants to look after his business. Earp and Holliday, who are old deputy sheriffs of Dodge, also intend visiting friends, so they say, and Collins is going along to keep the others company. "Rowdy Joe," who has killed about ten men, and is the terror of Colorado, goes about for pleasure. Altogether, it is a very pleasant party. Their entrance into Dodge will mean that a desperate fight will take place. Governor Glick has, up to the present time, failed to preserve order, and unless he takes some determined action within the next twenty-tour hours, the men swear they will go to Dodge and protect themselves. For the good of the state of Kansas, it is hoped the governor will prevent violence. Luke Short over whom all this Dodge City excitement and sensation has been created, don't look like a man that would be dangerous to let live in any community. In fact he is a regular dandy, quite handsome, and Dr. Galland says, a perfect ladies man. He dresses fashionably, is particular as to his appearance, and always takes pains to look as neat as possible. At Dodge City he associates with the very best element, and leads in almost every social event that is gotten up. Dr. Galland thinks the ladies will yet be heard from in Mr. Shorts behalf. They have been very anxious to get up a petition among themselves to send the governor and it will probably come yet. They go further on and state that I am a desperate character, and that not long since I murdered an old grey haired man in Arizona and that I have been run out of nearly every country I have lived in. Which is as infamous as it is false, as there is not a civilized country under the face of the sun that I can not go to with perfect safety, excepting Dodge City, and there is no law to prevent me from living there, nothing but a band of cut throats and midnight assassins, who have banded together for the purpose of keeping all those out of the place who are liable to oppose them at the polls, or offer them opposition in their business. As to my murdering an old grey haired man in Arizona I was tried in a court of justice for any offence I committed there, and the records will show that it was a fair and impartial trial, and that I was honorably acquitted. The delegation who came here to see the governor, and who claim to represent the moral element of the town, was principally composed of tramps, who do not own a single foot of ground in the country, and never have. Masterson, Wyatt Earp, and all the sports in the country, held a meeting at Silverton and decided to take Dodge City by storm. Short is at Caldwell but will meet the party at Cimarron, 18 miles west of Dodge, perhaps Sunday night or soon after. Horses will be taken at Cimarron and the whole party will rendezvous at Mr. Oliver's, two miles west of Dodge. Doc Holliday and Wyatt Earp are now secretly in Dodge City, watching matters. When the time for action comes a telegram will reach them worded as follows: "Your tools will be there at ____," giving the time agreed upon. The plan is to drive all of Short's enemies out of Dodge at the mouth of the revolvers. 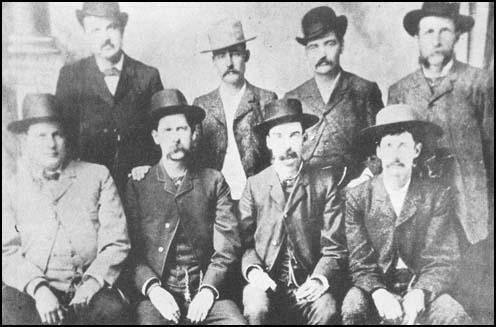 The much talked of band of noted killers who were to congregate here and accompany Luke Short, the exile, back to Dodge City, Kansas are in part at least, at that place now. Advices from there state that Luke Short, Bat Masterson, Charley Bassett and Doc Holliday at present hold the fort and that trouble is liable to ensue at any moment. Mr. Bassett was here for quite a time and with Colonel Ricketts at the Marble Hall. He is a man of undoubted nerve and has been tried and not found wanting when it comes to a personal encounter. But Masterson and Doc. Holliday are too well known to need comment or biography. A notice has been posted up at Dodge ordering them out and, as they are fully armed and determined to stay, there may be hot work there tonight. I arrived here yesterday and was met at the train by a delegation of friends who escorted me without molestation to the business house of Harris & Short. I think the inflammatory reports published about Dodge City and its inhabitants have been greatly exaggerated and if at any time they did 'don the war paint,' it was completely washed off before I reached here. I never met a more gracious lot of people in my life. They all seemed favorably disposed, and hailed the return of Short and his friends with exultant joy. I have been unable as yet to find a single individual who participated with the crowd that forced him to leave here at first. I have conversed with a great many and they are unanimous in their expression of love for Short, both as a man and a good citizen. They say that he is gentlemanly, courteous and unostentatious - 'in fact a perfect ladies' man.' Wyatt Earp, Charley Bassett, McClain and others too numerous to mention are among the late arrivals, and are making the 'Long Branch' saloon their headquarters. All the gambling is closed in obedience to a proclamation issued by the mayor, but how long it will remain so I am unable to say at present. Not long I hope. The closing of this legitimate calling has caused a general depression in business of every description, and I am under the impression that the more liberal and thinking class will prevail upon the mayor to rescind the proclamation in a day or two. Our city trouble is about over and things in general will be conducted as of old. All parties that were run out have returned and no further effort will be made to drive them away. Gambling houses, we understand, are again to be opened, but with screen doors (probably ornate oriental type door shields designed to obscure the view from one room to another rather than fly screens) in front of their place of business. A new dance house was opened Saturday night where all the warriors met and settled their past differences and everything was made lovely and serene. All opposing factions, both saloon men and gamblers met and agreed to stand by each other for the good of their trade. Not an unlocked for result. The mayor stood firm on his gambling proclamation, but as his most ardent supporters have gone over to his enemies, it will stand without that moral support he had calculated upon to help him in enforcing it. We have all along held that our mayor was over advised in the action he has taken and had he followed his own better judgment, and not the advice of schemers and tricksters who had selfish interests at stake, and not the best interests of this community, he would have fared much better. No one knows this now any better than himself. He has freed himself from that cropped-winged moral element and stands on the side of the business interests of Dodge.